The granite-wheeled steamless steamroller pushed around by Fred Conan-quads Flintstone is number three on TIME magazine’s list of the best fictional vehicles of all time. It’s recognizable enough that it was featured on the 1994 live-action movie poster, and the iconic image of the car tipping after receiving a rack of brontosaurus (read apatosaurus) ribs is all-too familiar. 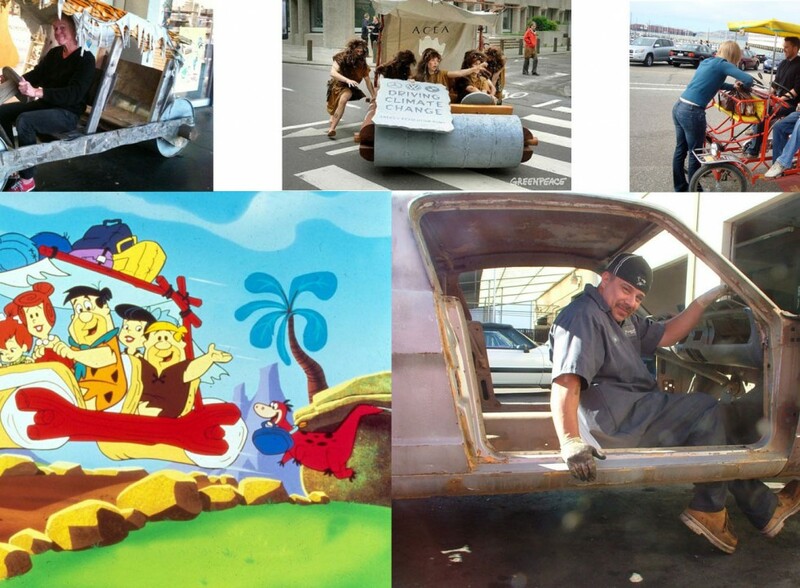 There are many benefits that could be used in modern society by a human-powered vehicle, so we must turn to the beginning of the modern stone age: could someone actually move a car like the Flintstones’? Image courtesy of Crazy Jen’s blog. 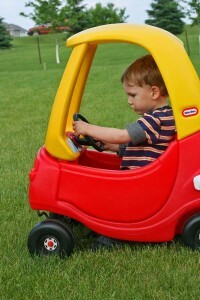 As a child, I remember trying the Little Tikes foot-powered car pictured to the right. I don’t remember it working very well, but then I wasn’t the picture-perfect image of masculine muscle I am today. While stone car look-alikes abound on the Internet and elsewhere, most of them use materials other than granite for the wheels, lowering the vehicle mass considerably. 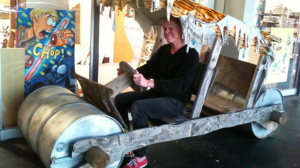 You can even buy a functioning replica of the Flintstones’ car, but it doesn’t use the same human driving mechanism. There is an admirable group of boy scouts who regularly build wooden vehicles, but the propulsion is again done through other means (i.e. slave labour. I’m not judging, Troop 122). A real-life test of a replica may have been averted by science-hating thieves who stole it from an unsuspecting comic shop. I wanted to interview Greenpeace after they made an excursion in their own rendition of the Flintstones car, but unfortunately they were arrested. The real heart of the problem–thank the Good Lord–comes down to a question of physics. I know you were worried it might have been something more esoteric, but you can rest assured that we’ll resolve the issue with a protractor, a slide rule and some yabba-dabba-dooduction. This car was thieved before science could be done. There are two excellent articles which outline the reasons why Fred Flintstone couldn’t use the friction of his feet to stop a regularly-moving automobile, and I encourage you to read their toe-tickling truisms. What they haven’t done, however, is calculate the ability of a human to drive the vehicle in the first place. I will use Scientific American’s estimates and assumptions of the car mass: namely, that it is mostly going to be comprised of the two granite slabs making up the front and rear rollers. We’ll assume the slabs are 1.5 meters long, and 0.8 m in diameter, which will make each of them have a mass of 360 kg. Add about 50 kg for the wood and tarp on top, and 95 kg for Fred himself, and you have to move a mass of 865 kg. The maximum values for human power output are held by cyclists, with top athletes being able to pump out 6 Watts per kilogram of their own mass. If we assume Fred Flintstone was in prime shape after all those bronto-burgers, then he could generate about 570 W of power. Therefore, Fred Flintstone would be able to move at the average Canadian speed limit in cities! 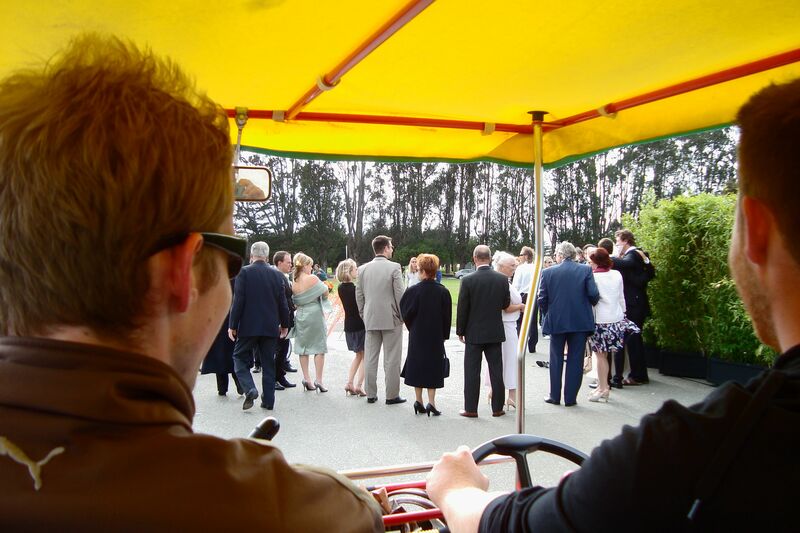 If additional family members helped out, then it would indeed be a feasible form of transportation. As the above-linked articles emphasize, however, the stopping distance would be much longer than the cartoon implies. 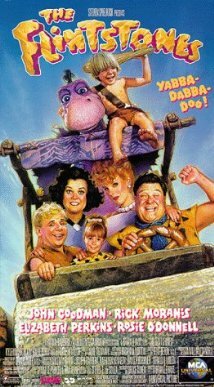 OK, the more astute of you may have noticed a glaring detail I’ve left out: how does Fred Flintstone and his family bring a dinosaur in their vehicle? That mass is significantly greater. Although Dino is officially listed as a Snorkasaur, for the purposes of this discussion we will assume he is an adolescent apatosaurus from the sauropod family. The mass of adults ranges from 16 to 22 tonnes, so we’ll assume Dino’s about 10 tonnes. That adds 10,000 kg to the mass of the car, making it completely impractical to bring Dino anywhere. If you go through the above calculations again the additional mass makes the required force 533 N, making the speed about 1.06 m/s or 3.8 kph, about as fast as walking. 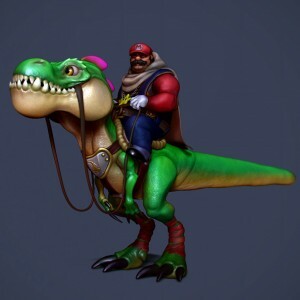 But what if Dino brings his own form of propulsion? Animals expel a fair amount of methane during the process delicately referred to as flatulation. Apparently at one point an Australian company may have been handing out carbon credits for every dead camel–that’s how stinky they are. There are suggestions that dinosaur *ahem* farts may have warmed prehistoric earth. The estimates of an apatosaurus’s yearly methane output are about 690 kg. If we assume that sauropods outgas at about the same rate as mammals, say an average of 20 times a day, then that brings the average farted mass to about 0.095 or 0.1 kg. 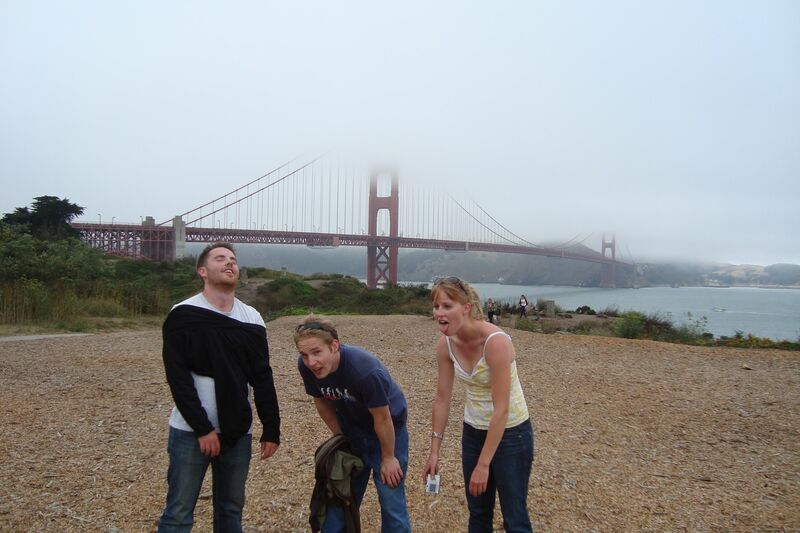 The average fart is ejected at about 3 m/s. Let’s say the apatosaurus can do at least 10 times better than we can in this department, since its bowels could probably strangle a skyscraper. The momentum thus imparted by the flatulent Dino would be 3 kg * m/s. This change in momentum for the gas would result in an equal and opposite change of the entire car’s speed, of … 0.0003 m/s if we assume Dino is riding onboard. If we neglect Dino’s mass, then the change is still only 0.003 m/s. If we assume Dino saved up the entire year’s worth of methane for one enormous tectonic-plate shattering fart of 690 kg, that would bring the speed change to about 2 m/s, which is a more respectable change of 7 kph. 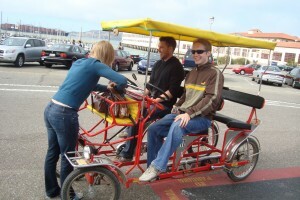 That brings the total to about 11 kph, which is a little bit better than jogging, and with the entire family helping out, that could still make for a viable mode of transportation. Did the Flintstones always leave Dino behind? Image from TIME magazine. The Flintstone family could indeed move the granite-wheeled goliath with their own power, but they’d have to be able to exert as much wattage as Olympic cyclists. As far as bringing their pet Dino out to dinner, this must be a much-less-frequent affair than depicted on the show, and Dino would have some serious indigestion in order to expel his year’s worth of fart in one fell swoop to bring the vehicle to a respectable cruise. It would definitely not make the Flintstones friends with the neighbours, and the fact that Barney and Fred are still on speaking terms is a testament to the true power of human kinship. 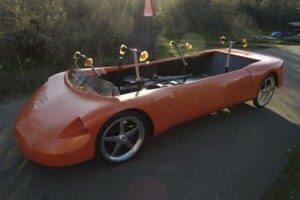 The Urbee 2 hybrid car. 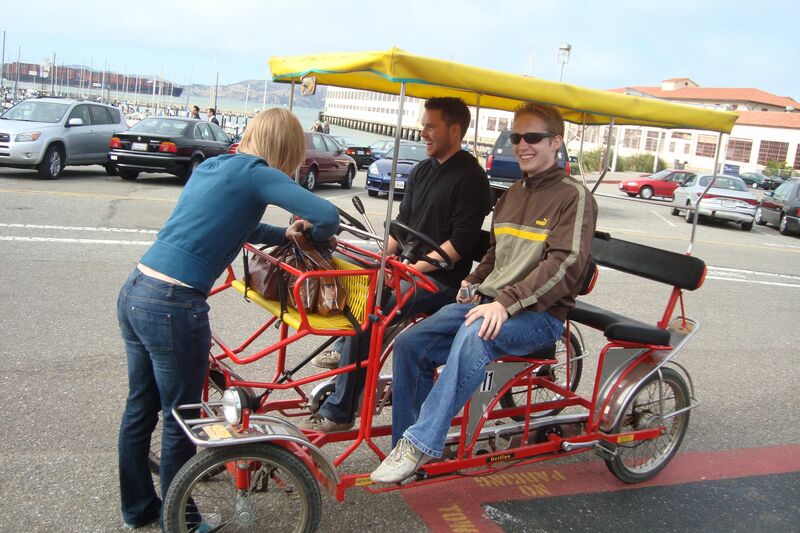 If you’re interested in getting your own foot-powered cars, toy versions are available, and there is even a patent on a foot-powered vehicle, although it appears to have a mechanism different from that of the prehistoric populace. 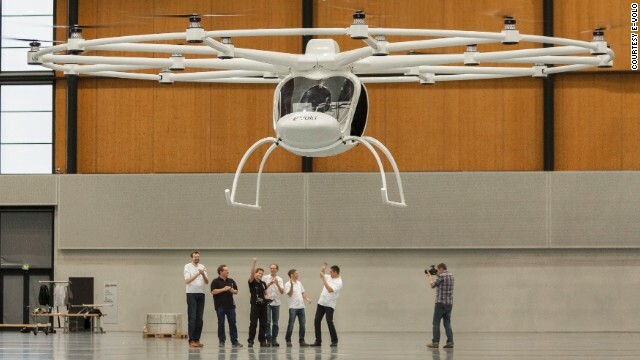 The Scooser apparently combines human power with electrical motors, though the parallel propulsion is another matter for discussion entirely (the Urbee 2 is another candidate in the same field). There’s a professor who’s done away with feet power altogether, and instead put forth rowing. You just need a team of friends whenever you want to go somewhere — no big deal. 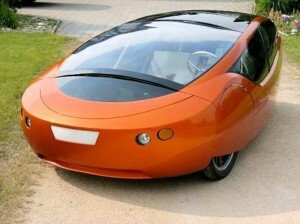 HumanCar’s Imagine PS hybrid human-electric car. 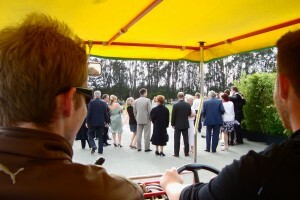 I’ve personally tried a quad cycle with the leg power of 3 other friends, and I can attest to how tiring it can be. 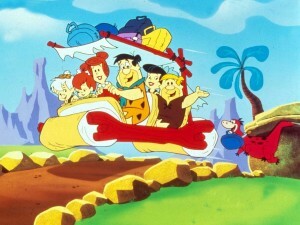 I put forth that the Flintstones didn’t live in San Francisco, but more likely Saskatchewan. Arrived at our destination in good health (?) and good time (?). It starts with a look, a passing glance between strangers: one blazing through the cosmos at the speed of light, the other drifting slowly with its head in the clouds. The collision is unexpected but somehow inevitable, a union that promises some of the sweetness that lay beyond the rainbow. The heavier partner is excited beyond measure, active and hopeful. It never occurs to them that their marriage is borne of chance, of probability, of particle calculations drawn up on a chalkboard in a dusty old professor’s office. Density is not familiar to either half of the couple. A cosmic-ray-generated neutron is absorbed by a nitrogen-14 atom. The everyday habits, the humdrum quirks that can’t be seen in a mirror, dig deeper and deeper into the foundations, cracking the joists of their carefully-constructed home. Their split is violent, affecting everyone around them. The energetic outburst pushes them farther and farther apart, colliding with the lives of anyone in the danger zone. They don’t care nor do they notice the damage they do. The nonsense life of false promises is broken, and one partner moves away light and positive, the other simmering with unresolved rage. The intermediate-state heavy nitrogen decays into carbon-14 and a proton. Image courtesy of Brooklyn College. The heavier partner can’t pinpoint exactly what’s missing from its life, but can no longer draw hope from the wells of its spirit. It looks in the familiar places but they no longer hold the meaning they once did. They belong to a childhood long since past, a time of magic when anything was possible and the shackles of reality were mistaken for rings of power. The heavy partner wants to find a solution, a cough-syrup remedy that will make the pain disappear, make the memories disappear. Where it can’t find quality, it goes for quantity, descending deeper into the maelstrom as though that might calm the turbulence. The carbon-14 atom combines with two oxygen atoms to form carbon dioxide (CO2). It was quick. It was painless compared to what came before. Stability is brought on through multiple partners, who each ask for more, but it’s as though the heavy partner can give it all now. Sharing comes naturally, since it no longer associates itself with any part of its being. The two excitable and demanding playmates drag the heavy one all over — though it is no longer bearing the brunt of the weight. It becomes lost in a world too far beyond the threshold of its ability to care. It becomes nothing more than a number, the parts making up the puzzle of its proportions: fourteen. 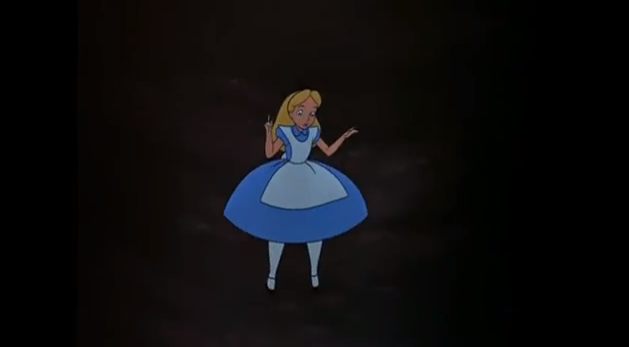 14 doesn’t seek to be anything other than a number, and after a time, it doesn’t see how it ever could be. Eventually the playmates are lost, but 14 couldn’t say when or where or how. What surrounds 14 is not its environment. It is a cloak of coal, soot, and smoke, insubstantial but obscure. The carbon-14 atom is introduced into organic matter through photosynthesis (producing O2 out of CO2, leaving the carbon atom in the biosphere). 14’s new life is rife with activity, and through its thick-headed tunnel vision it glimpses flickers of others much like itself, others who were born in the stars but decayed into obsidian. Others whose hearts were broken, who don’t know what relationships are, and who have forgotten. 14 also sees others who have not been shattered, who bear the weight of the world somehow with much less on their shoulders. The twelves, 14 thinks, are a breed of ignoramuses too naive to function in the real world, too airy to be practical. The numbness in 14’s being thaws into a tropical storm. Rapid outbursts threaten to take over 14’s calm and monotonic life. The twelves are all around it, in higher numbers. The others like 14 don’t offer much solace; they simply stoke the flames. It doesn’t matter that there are some 14s who have worked hard to get where they are. What matters is the twelves, young upstarts fresh out of the frying pan, are stepping through life not just unscathed, but content. The others tell 14 that these miscreants will soon get their come-uppance, but it never comes. 14’s blood slowly rises to a boil, frothing and roiling over the edge of what 14 had thought were dead parts of its soul. 14 hasn’t felt this strongly about anything since that first betrayal, ages and extinctions ago. 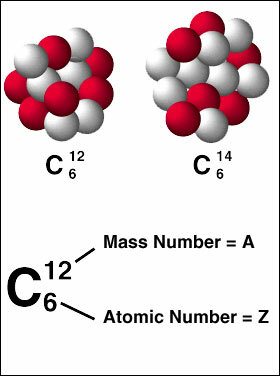 The ratio of carbon-14 to carbon-12 atoms in the biosphere is roughly constant, assuming a constant flux of cosmic rays. 14 doesn’t want everyone to do it. The twelves seem content — maybe if 14 only found the right venue for its abilities, it could learn to feel again. 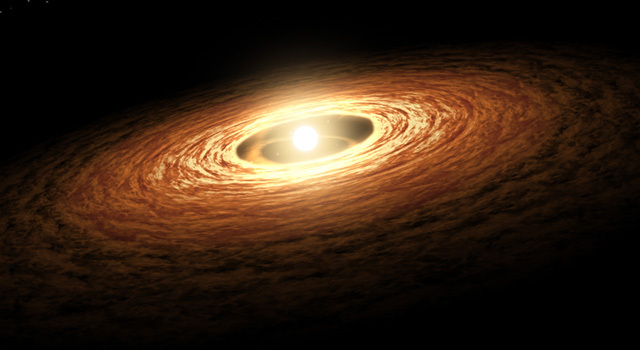 Learn to dissipate the hot mass before it destroys itself or those around it. The weakness tugs at 14, beckons, calls, and promises hints of the life it never wanted to believe in again. At first, 14 ignores the hints, and follows friends’ advice. Continuing on just makes the siren call stronger, however, and 14 yearns for freedom like a captain longs for the sea. Maybe five thousand years have passed, maybe ten. Maybe not more than a few weeks. 14 couldn’t mark the time at which resolve snapped, was leaned against a log and stamped into splinters. The surge of energy, the flow of awareness, pain, joy, relief, fear — is almost too much. 14 never would have believed it could have survived another encounter like this one. 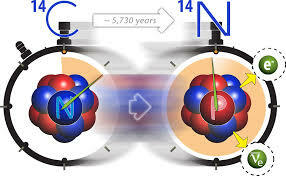 The weak nuclear force pulls carbon-14 apart by beta-decay, releasing an electron, a neutrino, and leaving behind the starting ingredient, nitrogen-14. 14 looks down at itself. It is still 14, but the negative energy has vanished, rushing off in a silent scream across the universe. 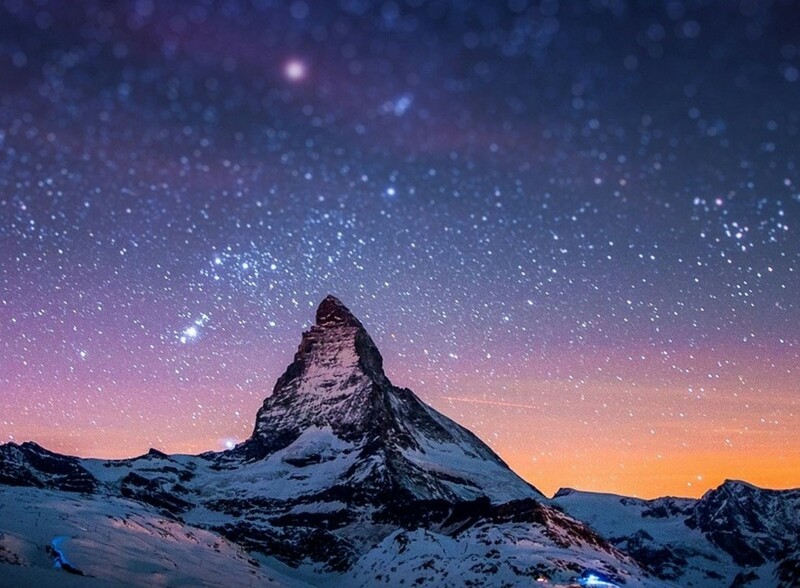 It is too staggering to believe, too great to be real. The heavy partner is now the heavy one, the same as it once was so many years ago before the traffic and tumult of time broke and bent its soul bonds. 14 laughs. And laughs and laughs. The absurdity of it all is that if 14 counts all the parts, all the constituents and sub-components, it is identical to when it first began, drifting about without an eye for anything below or beyond. But hidden deep within those parts is a history, an indelible script of roller coasters and merry-go-rounds for better or worse. 14 is as free and clear as ever, and looking in a crowd, you wouldn’t be able to perceive the difference. The crowd. The thought sobers 14, brings it back to a place of introspection and meditation. 14 hadn’t marked its own passage through the nether, its walk through the fire. It had only endured, unthinking. If 14 ended up in the same place as when it all began, couldn’t the same thing happen again? Couldn’t it happen to others? There had to be an answer. Others had to know. 14 began widening its gaze, noticing patterns and stripes that the wisdom of its years permitted seeing. In the flowing organic matter, the population was kept constant, the ratio of youthful twelves to 14s kept the same. But as the flow stopped, as matter lost life, the population dwindled. The old 14s were transformed and erased from memory, joining 14 to watch from afar. 14 was determined that this circle of life be used for some higher purpose, some richer meaning. Carbon-14 is replenished to maintain the same ratio in living organisms. Death stops this replenishment, meaning that the half-life or time it takes for half a carbon-14 sample to decay (5,730 years) can be used in conjunction with the current amount of carbon-14 to date the corpses of organisms. The careful records 14 kept began to take shape. The randomness took on order. The impossibilities took on probability. There seemed to be places where the information could be shared, demonstrated, to lessen the pain of travel. The passage needn’t be a burden. The journey could be a blessing. This was the gift 14 gave its people, the promise that whatever was happening was not the end. 14’s gift would be felt in a realm far, far away where, under other circumstances, the senses of protons and trials of electrons might never be felt. 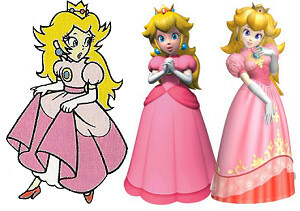 One of video games’ most famed princesses, Princess Peach has been kidnapped at least 12 times and has likely developed Stockholm syndrome along with bipolar disorder (based on her emotion-focused/mood-swing attacks in Super Princess Peach). 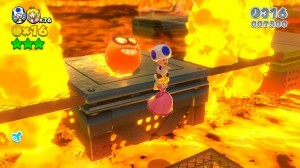 While the Toad security force’s efficiency as a protective agency is questionable, Peach’s ability to float has been unwavering, present in every single Mario game where she is a playable character. How does she do it? 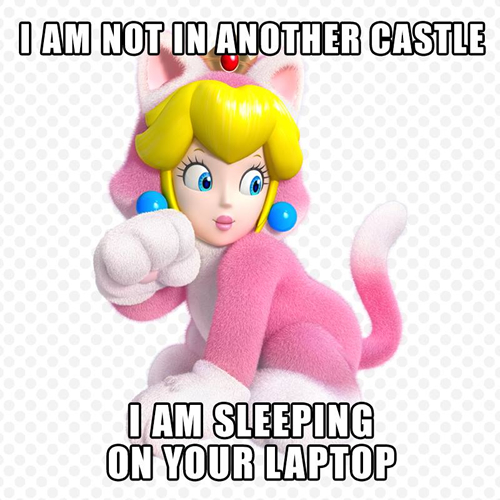 Peach is not alone in her hovering abilities. 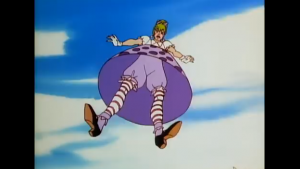 There are many female characters in popular media who have used either parachute petticoats or parasol parachutes to glide to the ground like an angel. 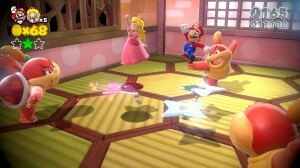 Peach started out floating in Super Mario Bros. 2 without any implement other than her dress, which is the parachute petticoat trope used in Lilo & Stitch comics, Alice in Wonderland, Chitty Chitty Bang Bang, The Adventures of Bullwhip Griffin, Superfolks, Mistborn, Jack-of-all-Trades, America McGee’s Alic, BlazBlue, Muppet Babies, the Backyardigans, Rugrats, Popeye, Animaniacs and even Jem and the holograms. The Misfits from Jem and the Holograms feature the Petticoat in their Lovesick video. 1. Does the Parachute Petticoat have a basis in reality? 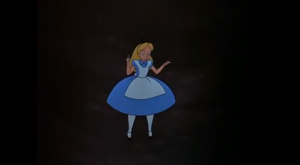 From Disney’s Alice in Wonderland. 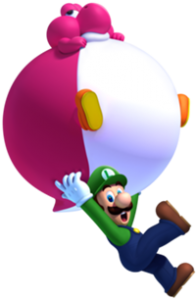 While this is certainly encouraging evidence for Peach’s hovering habits, it was a 75 meter fall, and Sarah still suffered internal injuries. 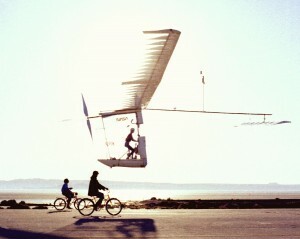 The wind requirement might even make such everyday use of the parachute petticoat unreliable. 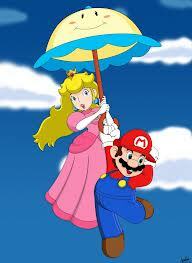 Perhaps that’s why, in later games, Princess Peach made use of an umbrella, à la Parasol Parachute. Image by LyndonPatrick of DeviantART. 2. Could a real-life Peach rely on a Parasol Parachute? 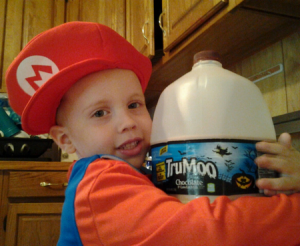 Again, Mario’s (or Bowser’s?) love is not alone in her use of an umbrella to improvise a parachute. It’s used often in manga, and has been donned by Batman’s Penguin, James Bond, the Aristocats, Jackie Chan, Inspector Gadget, Calvin & Hobbes, Tobias in Arrested Development, Lemmings and Chip ‘n Dale, Rescue Rangers. When there’s danger. Oh, and let’s not forget Mary Poppins! Professional scientist and amateur pro-skier Erik Roner decided to put Mary Poppins’s endless purse money where her mouth is. Or into the upper layers of the troposphere. He dove into the sky with an umbrella. This video is a must-see. 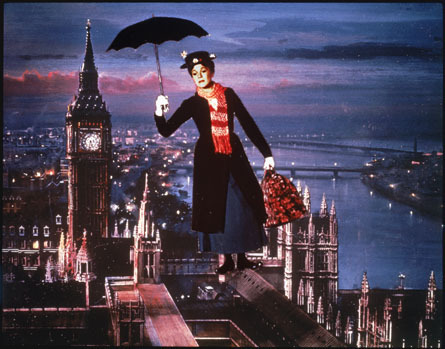 A spoonful of chamomile won’t help the adrenaline go down, Ms. Poppins. Although the umbrella’s tumble through the air didn’t end in the most delightful way, Erik Roner’s jump did. Score one point for brave scientists who happen to do sports occasionally. Minus one point for the viability of the parasol parachute. But could you do it if it was built properly? Unfortunately, the ever-thorough, peer-review-eluding Mythbusters team has debunked the idea of using of an umbrella to break one’s fall. A fall of 18 meters was demonstrated to be slowed by an umbrella, but ultimately still deadly. The best thing the parasol could offer would be to keep a princess upright as she plummets. 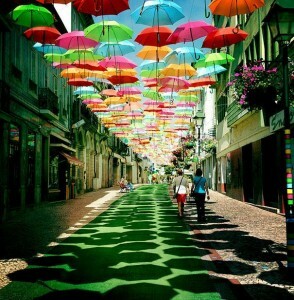 On a beautiful related sidenote, Patricia Almeida and Diana Tavares captured these gorgeous photos of an “umbrella roof” in Agueda, Portugal. 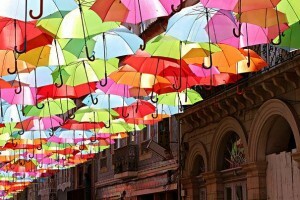 Were the designers similarly looking to the sky as to the umbrella’s potential? Photos by Patricia Almeida and Diana Tavares. Is this Peach? Photos by Patricia Almeida and Diana Tavares. So the conventional attire doesn’t appear to make the cut for the pale pink lady. Her dress is pretty large, however — could she be hiding some advanced technology within her underskirt? Pocketing some propellers in her pannier? 3. 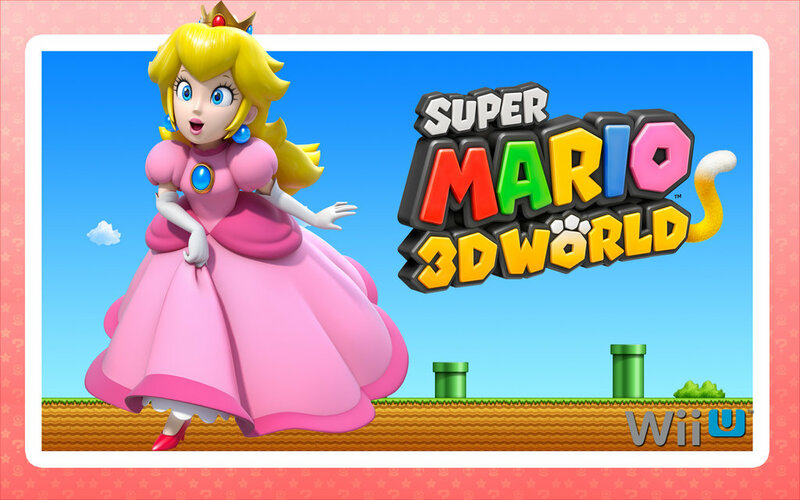 Can Princess Peach levitate? First of all, we’ll disregard the methods used by mystics, if only because Peach has become demonstrably more ditzy throughout the years of her evolution. Magnetic levitation, the effect observed when like poles of a magnet are brought together, is already used in high-speed bullet trains in at least China and Japan. Regardless of the mechanism by which the magnetism is generated, the effect requires magnets on both surfaces. 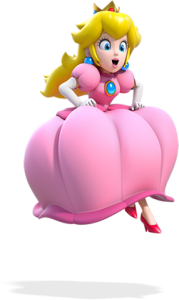 So even if Peach had magnets up and down the cage of her crinoline, she would eventually encounter a surface where magnets aren’t present. In fact, she often floats on grassy plains. So Maglev’s out. The Van der Waals’ force, a result of asymmetries in the electron clouds around atoms and random fluctuations, is a very weak force that can create repulsive or attractive forces. The Casimir Effect is something similar which only occurs at very close distances where quantum field effects come into play, and where similar fluctuations in quantum fields give rise to net force. It’s responsible for friction at the nanoscale, and very weak until you get sufficiently close — at a distance of about 100 atoms, it can exert a pressure of about an atmosphere. Scientists have figured out a way of making it repulsive, and the first application will probably be to create a “gap” between nanostructures that need to glide past each other. While this effect is often quoted for its potential in levitation applications, the fact that Mr. Casimir flexes his muscles only when you get really close doesn’t bode well for macroscopic real-world applications. At least for now. So that rules this form of levitation. That is, Lift (L) is equal to half the air density (p) times the square of the rotor velocity, times the planform area and the coefficient of lift. The maximum coefficient of lift for a typical cambered airfoil is about 1.75 (tilted at 15 degrees), and if we assume a modest rotor of 15 cm diameter spinning at roughly 3,000 RPM with normal air density (1.184 kg/m^3), we get a planform area of 0.0015 square meters, and an average velocity of 23.56 m/s. This all works out to 0.86 N of lift. Unfortunately, it doesn’t look like she’s got a swarm of sharp rotors spinning away under her dress, although the topic of what lay cached beneath the crinoline is a subject of rich depth in Internet communities. 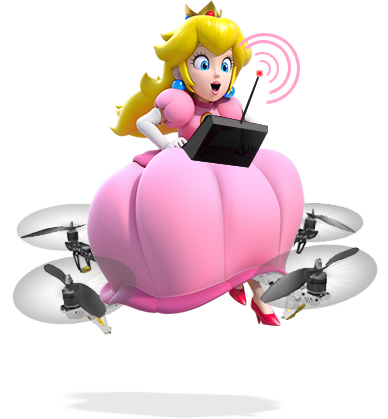 For the time being, it appears that Peach either has some top-secret military technology stolen during her long hours in Bowser’s research labs, or that she’s an entity whose abilities extends beyond our current understanding of the physical world. Image by LuigiMarioGMod of DeviantART. Do you have a theory about how Peach floats? Or her bizarre psychology? Let me know in the comments! Art by DevindraLeonis of deviantART. Yoshi never mates with anyone, yet lays eggs regularly within the span of one mario level/adventure, which is maybe 2-3 minutes. That’s pretty impressive, and since Yoshis hatch out of eggs found in blocks, there is nowhere behind-the-scenes where shagging might be happening. So we can only come to the conclusion that either every Yoshi is in fact a pair of Siamese twins (joined at the… long prehensile tongue?) or that she reproduces asexually. I say she because there are in fact 70 or so species of vertebrates that reproduce asexually. They’re all female. Whiptail lizards are on this list along with other reptiles, so there are in fact many species that could exhibit this reproductive characteristic of Yoshi. Art by wsache007 on deviantART. But wait — isn’t asexual reproduction devoid of genetic diversity that allows for surviving adaptations to environmental changes? Not to mention less fun? Well, it turns out these asexual female lizards have double the number of chromosomes as sexually-reproducing species, and their chromosomes pair internally when they form gametes, producing similar benefits to sexual reproduction without the need for courtship. This could be an advantage in harsh climates where it’s difficult to find a mate. Like being a geek in high school. 2. 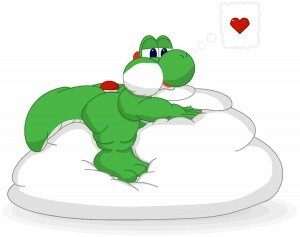 Yoshi reproduces after her tummy is full. At first I thought this was bizarre. She eats 5 apples, then poops out an egg. I asked myself how reproduction and excretion could be so intimately linked, but then found out that in fact the cloaca or “vent” that’s used for the two processes is common in all amphibians, birds, reptiles and monotremes. OK, so it’s not that strange to poop out an egg after all. However, isn’t it strange to initiate reproduction after eating a few apples? It turns out chickens activate their ovaries based on visual cues, and keep laying eggs daily until they go into the brooding stage where they sit on them and wait for them to hatch. If you remove the eggs before they go into the brooding stage, you now have yourself an egg factory. So activating egg production based on a physical stimulus has analogies in the real world. 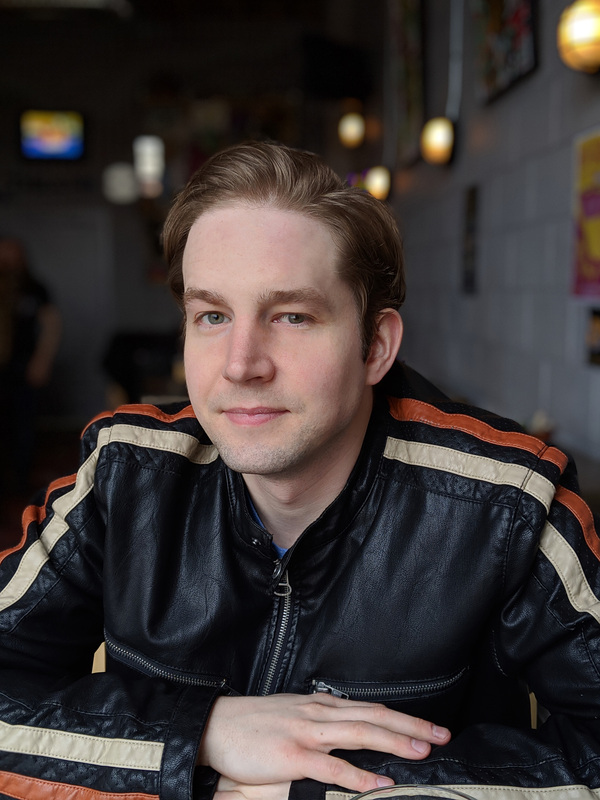 Further research shows that a stable food supply initiates earlier breeding in vole rodents, so taking a cue from food to get preggers is actually pretty reasonable for a smart Yoshi. 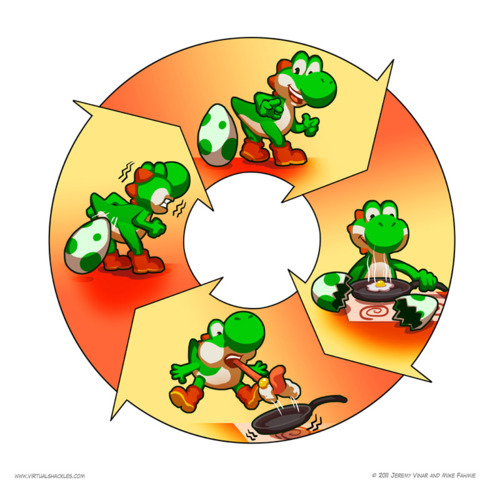 Yoshi’s eggs hatch into all sorts of crap, from mushrooms to fireflowers to raccoon furs. I’m not sure if there’s any animal on the planet that does that. 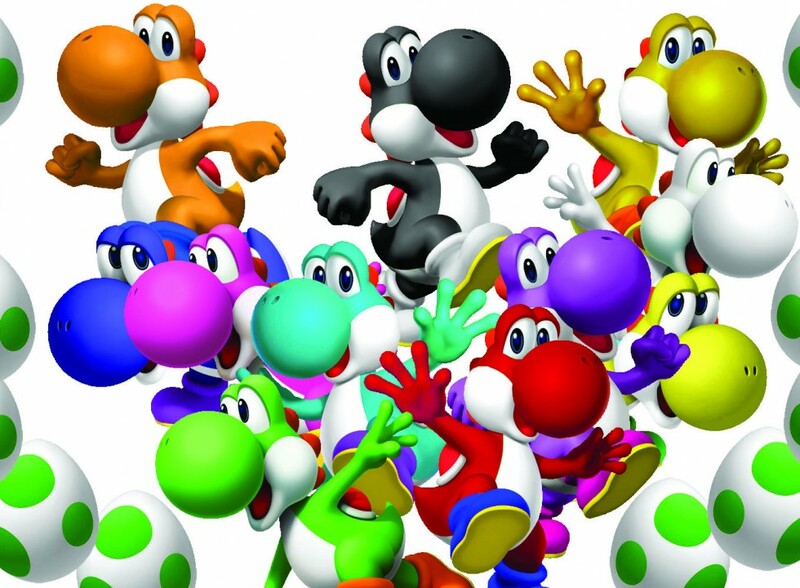 However, Yoshi’s asexual double-number-of-chromosomes nature is the result of the hybridization of two or more species, so there is in fact a lot of genetic material that went into making her. Maybe some mushrooms and flowers got mixed in there, and with the right chromosome pairing… miracles can emerge. Yoshi’s ability to do an extra little push through the air by kicking her legs is one of the main reasons she’s such a likeable sidekick. There are, in fact, leaping frogs who spread wing-like ribs a little bit like flying raccoons. Apparently they can sail up to 30 feet, which is more than enough for a desperate platforming plumber. 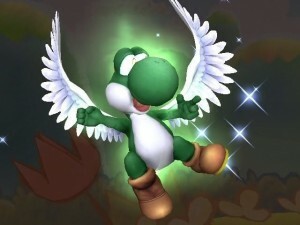 You might argue that Yoshis don’t necessarily have wings (unless they eat a certain colour of turtle shell, which is another matter entirely). While that’s true, lizards in fact throw their tail around to alter their trajectory while in mid-air. Researchers are making use of this fact with robots, bringing us ever closer to dinobots. Image courtesy of Comic Vine. 5. 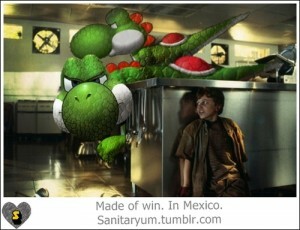 You can ride Yoshi. 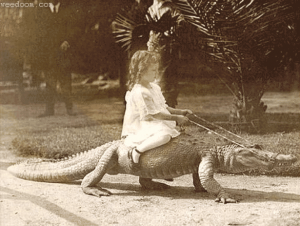 Anyway, apparently the only real evidence of lizards you can ride are drunken tourists who also dream of a Yoshi verisimilitude, and a Cambodian child with an enormous python for a pet. So for the time being, at least, the closest you can get will be to “ride the snake”, a term for overcoming life’s psychedelic obstacles, to put it gently. 6. Yoshi’s eggs are spotted. This one’s a fairly easy requirement: many birds and reptiles have spotted eggs, and in birds the spots are actually indications of protoporphyrin deposits that compensate for a thin egg wall caused by calcium deficiency. The more spots, the less calcium there is in the surrounding ground/environment. 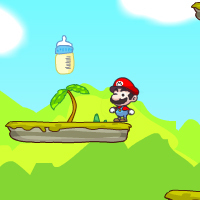 Since Yoshi’s eggs are always spotted, we can conclude that Super Mario‘s World needs more milk. 7. Yoshi has a very long prehensile tongue. Art by ZeFrenchM on deviantART. While tongues that you can use like an extra arm are commonly listed as a superpower, there are in fact many animals with incredibly long tongues, or tongues that do things you’d (hopefully) never dream of. 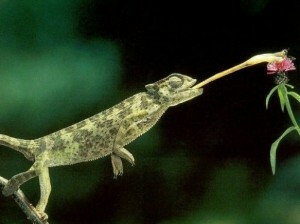 From chameleons that strike their prey to giraffes that need to clean bugs in hard-to-reach places, prehensile tongues are pretty viable in lizards. 8. Yoshi wraps herself in an egg for protection. 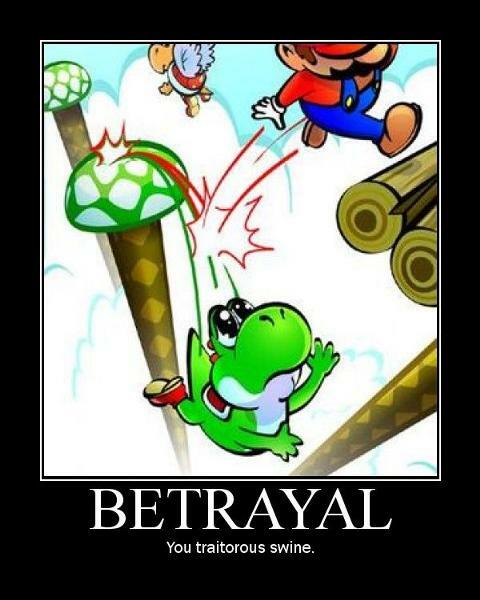 This phenomenon was first demonstrated in Super Smash Bros., and in sequels Yoshi could even roll around in it. Is there anything even remotely close to that in nature? The African bullfrog, the Australian water-frog and the Mexican masked tree frog all shed their skins, along with a healthy amount of mucus, that hardens to form a protective cocoon. So, while Yoshi’s ability to pop in and out of her protective “egg” is much more rapid than one would expect (and strangely similar to her reproductive secretions) the defensive maneuver of cocooning does indeed have some basis in the real world. The closest thing to a Yoshi on our limited blue planet is a female asexually reproducing whiptail lizard who has somehow hybridized with a bullfrog, mushrooms and flowers. She’d need to grow up in an environment where food is so tightly linked to reproductive stability that it induces it almost immediately — probably a tropical apple orchard. Add to that some genetic modification to increase its size, and human domestication to make it ever more cute and cuddly, and you’d have a rideable hybridized bullfrog-mushroom-flower-whiptail Yoshi. But would the reality be more horrifying than we think? While the above criteria would pass for most Yoshi-lovers, some die-hards may have noticed some aspects of Mario’s helpful green dinosaur that I’ve left unresolved. 1. Yoshi can speak. In the Mario RPG games, Yoshi’s vocabulary extends well beyond saying her own name. 2. Yoshi pounds the ground to kill prey. Boa constrictors don’t “crush” their prey, so they don’t count. 3. Yoshi adapts rapidly to environmental stimuli of turtle shell species. She can fly, breathe fire, inflate like a balloon… maybe some of these aspects could be mixed into the hybridized lizard? Can you think of anything else I’ve missed? I’d love to hear your thoughts in the comments! This Saturday, I’ll be joining a horde of local authors in Sherwood Park for a book fair. I’ll be reading my children’s story “The Tokayak’s Tokomak”, which is a guaranteed crowd-pleaser. Come by, say hi, and support local artists! Grab a coffee, shop for books, and meet local authors at this annual celebration of writers and poets. Plus, listen to authors share their works in an open-mic session and snag an autograph on your new purchases. 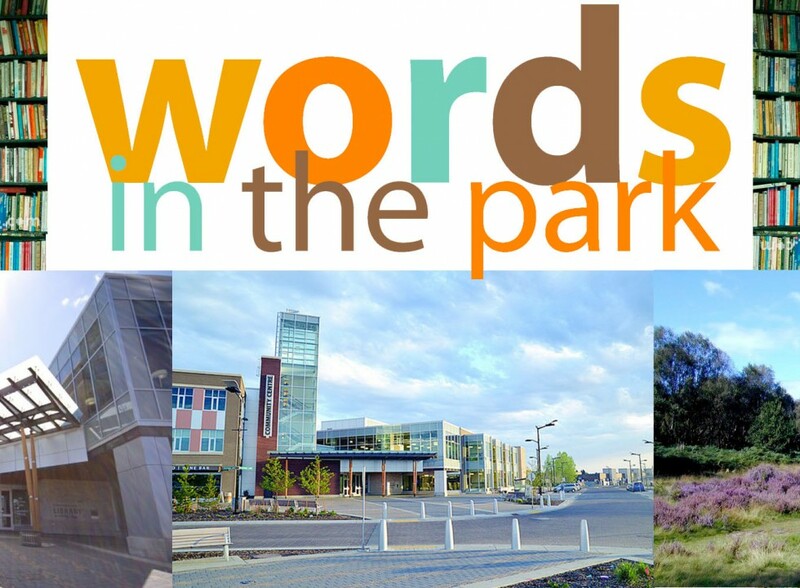 Click here to find out who is coming to Words in the Park 2013!